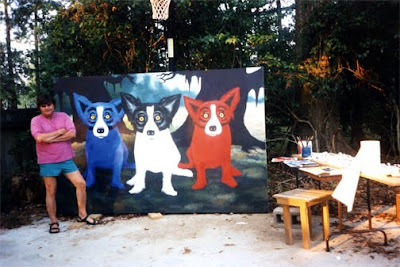 George Rodrigue has two sons, André (born 1975) and Jacques (born 1981). 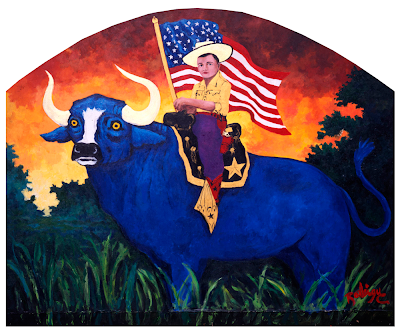 They are as accustomed to the question “Do you paint?” as I am, maybe more; however, neither one followed in their dad’s artistic footsteps. 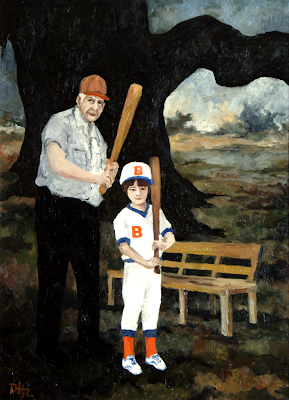 Over the years George has painted his boys many times. 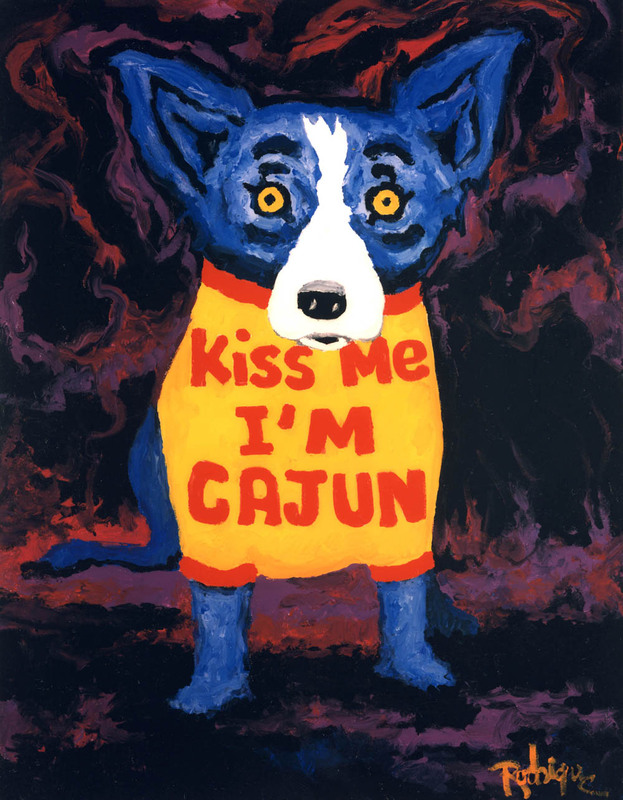 Kiss Me, I’m Cajun, featuring André, is probably the most famous. 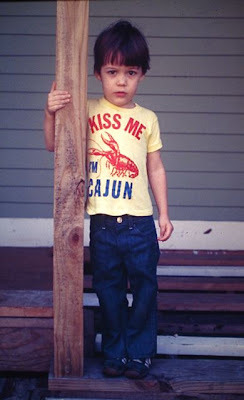 As I’ve mentioned in previous posts, the Cajun culture was relatively unknown to the world outside South Louisiana in the 1970s, and so imagine George’s surprise when he found this child’s t-shirt at a flea market in Houston, Texas. He saw this as a sign that the Cajuns had broken out, and that perhaps the rest of the country would learn about this unique culture after all. 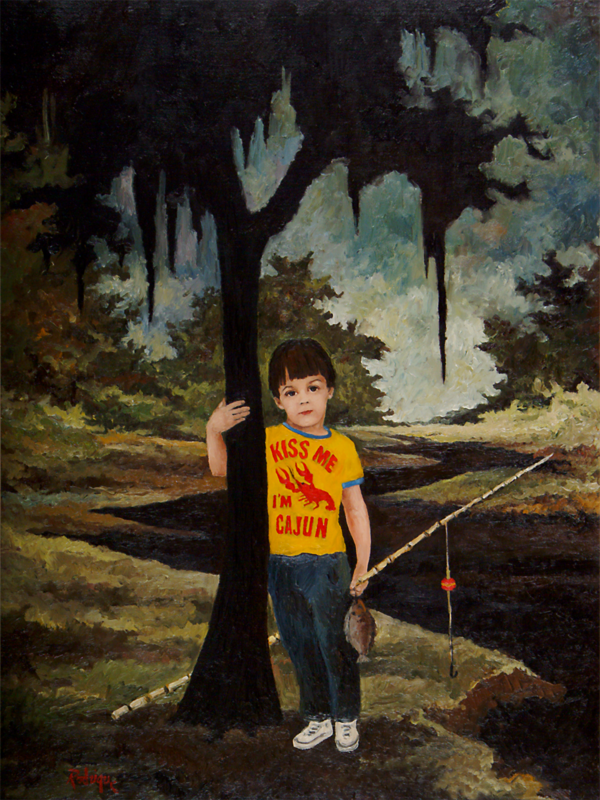 He commemorated this realization with a painting of a typical Cajun boy holding his cane pole and his catch. The young child leans against a young oak and stares at us. Soon after he completed it in 1979, the painting graced the back cover of the Lafayette Junior League cookbook, Talk About Good II, which they recently re-printed with flipped covers, placing André’s portrait on the front. 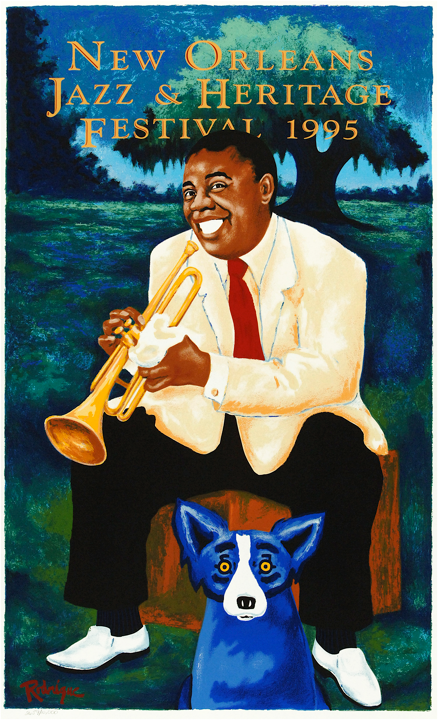 It hung last year at the New Orleans Museum of Art’s (NOMA) exhibition Rodrigue’s Louisiana, and André blushed with the attention as he signed cookbooks and posed for pictures. 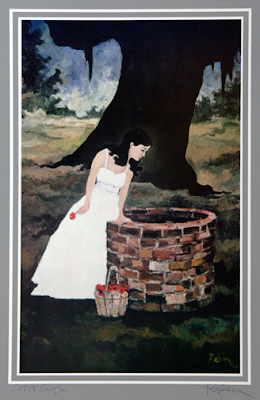 Nearly all Louisiana women know this cookbook, and the accessibility of the original painting (for the first time ever on public display) and especially its tall, dark, and handsome model, was a highlight for many. 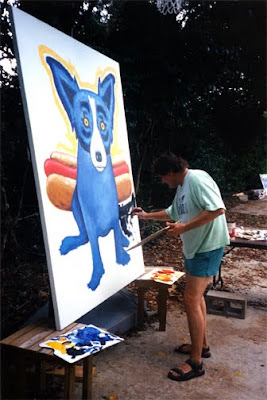 George approached this concept again years later with the Blue Dog, an homage to the original painting of André. Paint Me Back Into Your Life features a young Jacques alongside the Blue Dog and holding a painting. For the photograph George posed Jacques holding a different image – a painting by his brother. 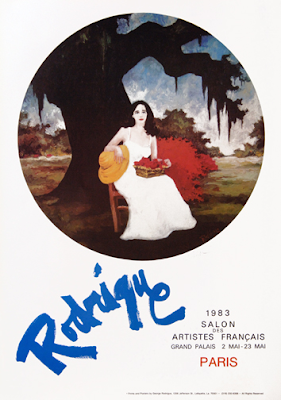 To create the final portrait, however, George sketched his design and left a blank square in place of André’s painting. He then stationed Jacques at his easel with his paints and brushes and asked him to fill in the blank square directly onto the large canvas. 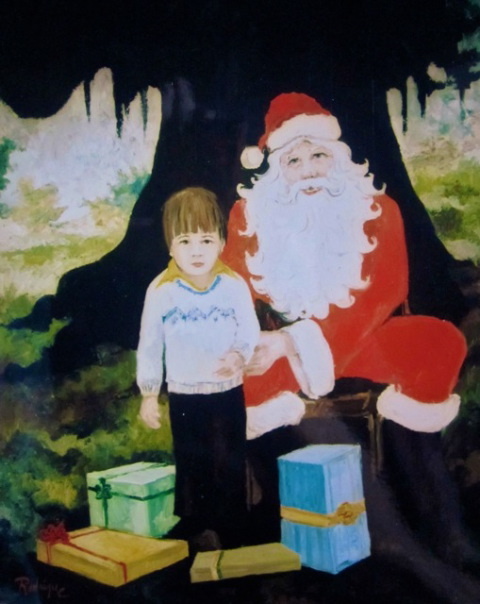 Jacques painted an oak tree and because it was the holidays, added Christmas stockings. 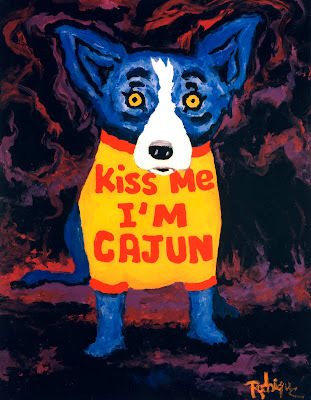 Like Kiss Me, I’m Cajun, this charming painting also hung in the NOMA exhibition, where an embarrassed Jacques signed autographs and posed for pictures. In addition, George chose this piece as the signature painting within all materials related to the George Rodrigue Foundation of the Arts (GRFA). …and Jacques playing in the backyard or dancing at the fais do-do. Tiffany, the family pet, also makes an appearance, pictured here with Jacques, even though she died in 1980, the year before he was born. 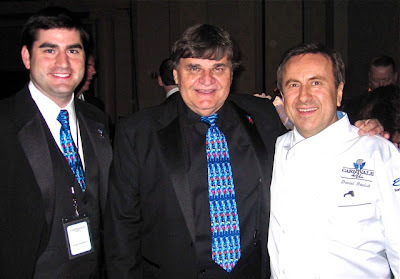 I first met André and Jacques in 1991 and spent increasing time with them after George and I started dating in 1993. 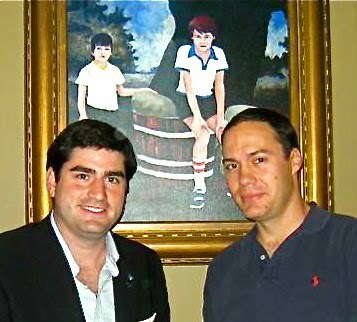 When we married in 1997, we all lived in Lafayette, Louisiana in a 1950’s plantation-style home located in an old family neighborhood called Bendel Gardens (as in Henri Bendel of New York shopping fame). George’s mother, in her 90’s at the time, also lived with us, as did George’s friend Romain Fruge. We had a busy house with people coming and going all day long, and it was an adjustment for me, after having lived on my own for twelve years. I’m forever grateful to Kay Bowen, who gave me Marcelle Bienvenu’s Who’s Your Mama, Are You Catholic, and Can You Make a Roux?, a cookbook that saved my life with my new Cajun family and which continues as a staple in my kitchen. (I actually sent a letter to Ms. Bienvenu and told her so --- the only fan letter I’ve ever written). Game days, something I’d never experienced living with my mom and sister, were huge and meant a dozen or more extra boys. I became adept at one-pot cooking and often harvested from our backyard, where I dug in the dirt most mornings tending to the okra, tomatoes, jalapenos, and blackberries. 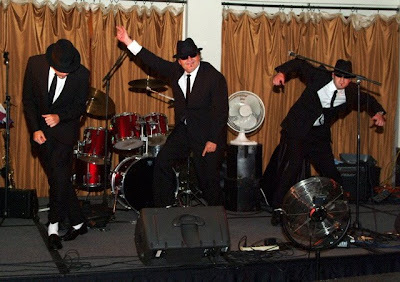 These were happy days, full of activity and chaos, an interim period really, as we observed George’s aging mother (she died last year at age 103), and as these young boys became young men. 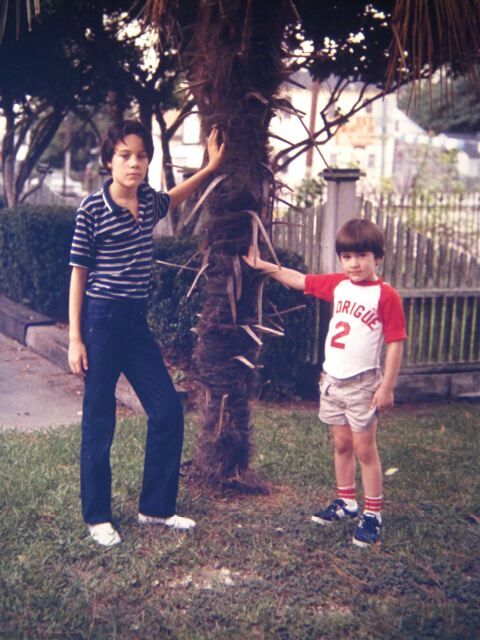 Even as kids they were independent and brave, biding their time with hockey, soccer, and girls until before we all knew it they were grown and ready to go off on their own. 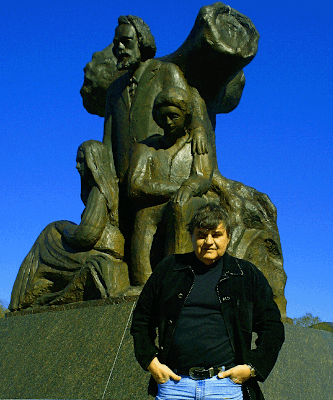 André lives in Lafayette, where he’s a student of history at the University of Louisiana (ULL). He’s one of the most well-read, intelligent, genuine, and kind-hearted people I’ve ever known. Several years ago we took a family vacation to a Wyoming dude ranch, and when I asked André as he lounged on the front porch what he was reading, he held up The Napoleonic Wars. (In embarrassing contrast, my idea of light reading on that trip was Blonde by Joyce Carol Oates). Together with attorney Steve Santillo, André and Jacques own the Blue Dog Café and Jolie’s Louisiana Bistro in Lafayette, Louisiana. André, because he lives in Lafayette, remains involved on a daily basis, whether he’s weighing in on the new menu, brainstorming in promotional meetings, painting the walls around the iron staircase, or making hundreds of seafood wontons in the back. Jacques lives in New Orleans in an 1850s traditional shot gun house, located just behind our home in the Faubourg Marigny. After graduating from Louisiana State University, he attended Tulane Law School, and (to the great relief of myself and his father) chose to join our business --- the galleries, the foundation, and everything it takes to run both of those entities, along with countless smaller projects. 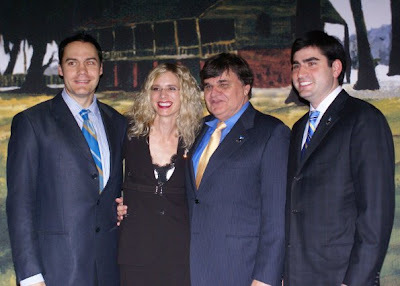 With all of our good fortune, the thing we are most grateful for, most pleased with, is George’s sons. 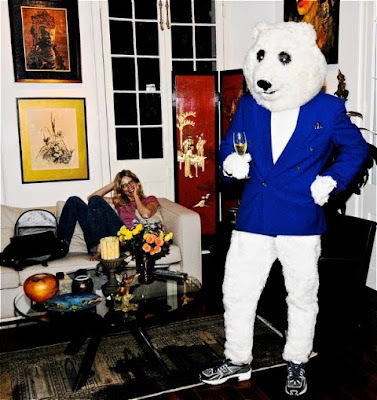 George is a proud father to be sure, and he encourages his boys in their passions, even if it means expanding the warehouse to include ten more boxes of collectible action figures, or approaching his publisher with the latest edition of the Bear Head calendar. 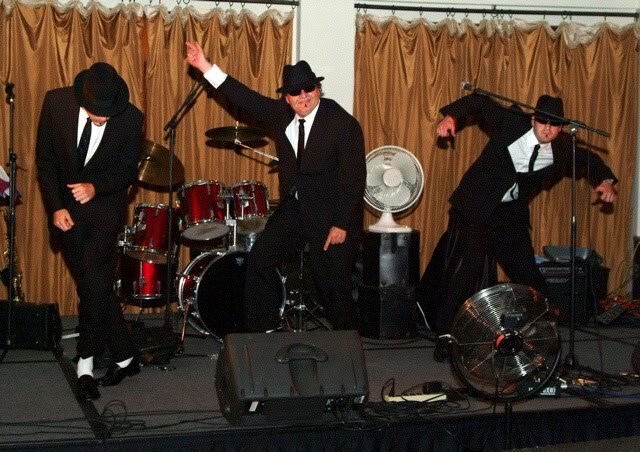 He takes them seriously in all of their endeavors, and he never denies them anything if possible. I asked him about this once. I’ve already written in the post “How Baby George Became an Artist,” about his mother’s insistence that he ‘get a real job.’ But he also told me a story about having saved his pennies for months to buy a telescope, only to have his parents return it, claiming it was a waste of money. Similarly, the last present he received from them was Christmas 1954. He was ten years old, and they felt it was no longer necessary. 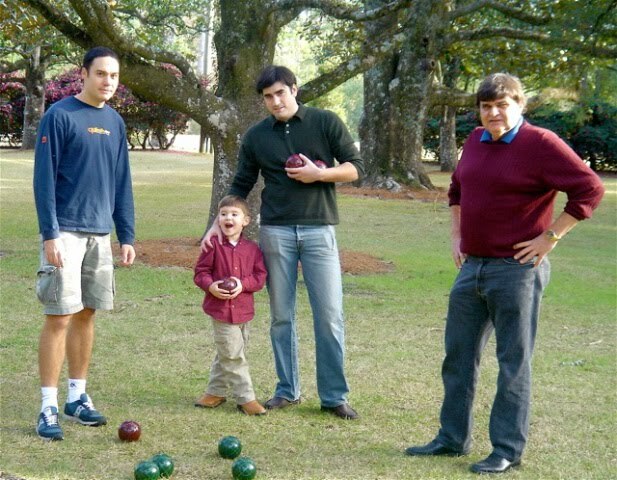 He decided as a boy that his own children would have everything they wanted, and he’s done his best in that regard. Are they spoiled? 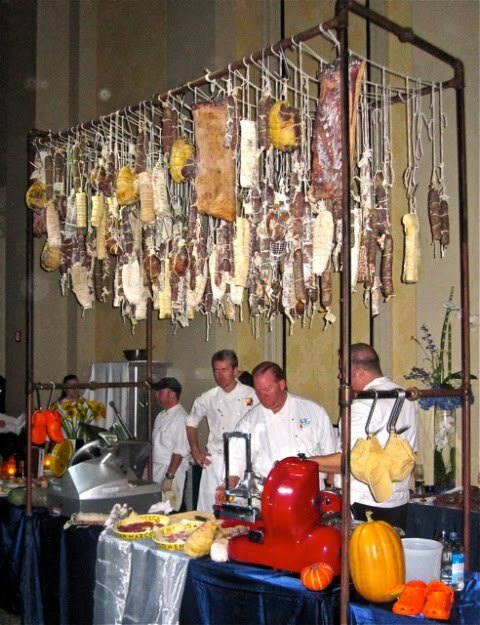 Surprisingly not, and even more surprising, they rarely ask for anything excessive. In fact, in recent years they rarely ask for anything at all. For me, although André and Jacques are not my children, they are my family. I’ve collected these pictures and saved this essay for several months, wanting to post it now, the week of Thanksgiving. The older I’ve gotten, the more I’ve realized that nothing is more important than family, and as we head to our rented cabin in the Smoky Mountains, meeting more family for a week of board games and BMX and turkey, I am immensely thankful. 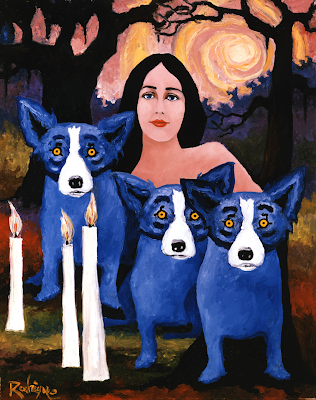 for more on Marie Rodrigue see the post "How Baby George Became an Artist"
for more on ULL see the post "Paintings for the Flora Levy Lecture Series at the University of Louisiana at Lafayette"
By 1993 the Blue Dog had far-reaching fame. 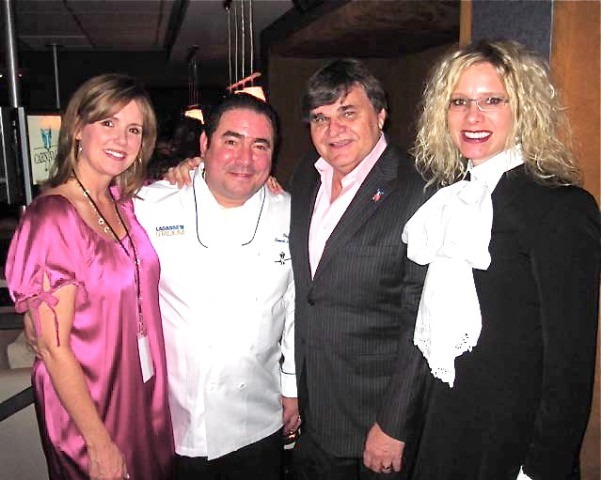 After the success of Absolut Louisiana the previous year, Michel Roux of Carillon Importers commissioned Absolut Rodrigue, which appeared full page in hundreds of magazines that year, and continued in hundreds more in the following. As recently as this past summer, it was the most highlighted of sixteen Absolut art pieces, including Jean-Michel Basquiat, Keith Haring, and others, at the Galway Art Festival in Ireland. 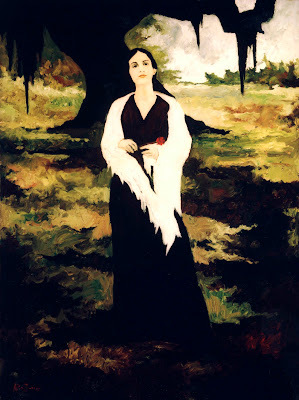 Local people in New Orleans and Carmel, California were accustomed for some time to the paintings by this point. I believe that many of them think that the paintings and prints are everywhere. But, not so. 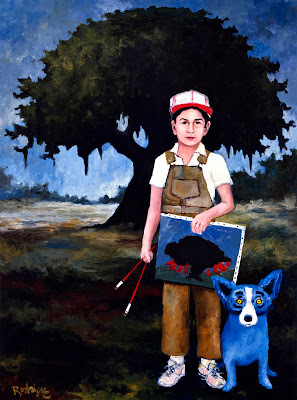 The lessons George learned in selling his landscapes and Cajun paintings serve him well, and he’s often said that had he discovered the Blue Dog twenty years earlier he would have ruined it. Instead, he’s cautious and protective. 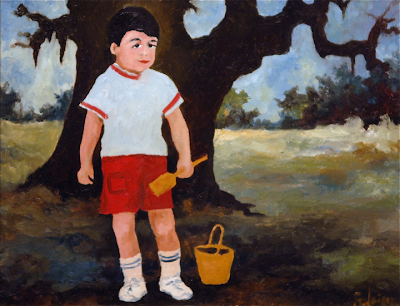 He avoids wholesaling, mass production, and products (other than books), so that the only place people find his work is in his own galleries in New Orleans and Carmel. This was long before his internet presence as well, so the galleries relied on foot traffic and the occasional news article to spread the word. 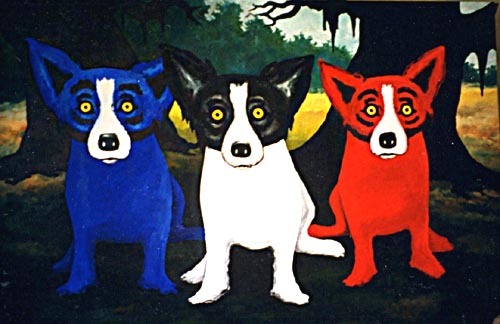 When the Absolut Rodrigue ad hit full page everything from Vanity Fair to Newsweek to People Magazine, it had the same effect nationally that the window of Blue Dog paintings had locally that Super Bowl Sunday of 1990 in New Orleans. Just as people stopped dead in their tracks before the window, people tore the ads from magazines and taped them to their refrigerator or hung them on their dorm room wall. Occasionally some skeptic gripes about George’s over-commercialization and ‘sell-out status,’ using the Absolut (and Xerox) campaign as an example. However, it’s important to note that George turns down countless offers for everything from t-shirts to umbrellas, not to mention product endorsements, movies, and cartoons. Absolut’s promotion is famous as an art campaign. Remember, George’s background at the Art Center College of Design in Los Angeles in the mid-1960s centered on the graphic arts and advertising design. The Absolut opportunity was exciting for him, as much from an art and advertising angle as it was for the exposure and name recognition. Absolut Vodka’s art campaign caused a sensation from the beginning, and George was in good company with several hundred other major American artists since that first Andy Warhol ad of 1985. (Xerox, and more importantly the opportunity to work with Young & Rubicam, is a similar story, featured in the post Blue Dog 2000). 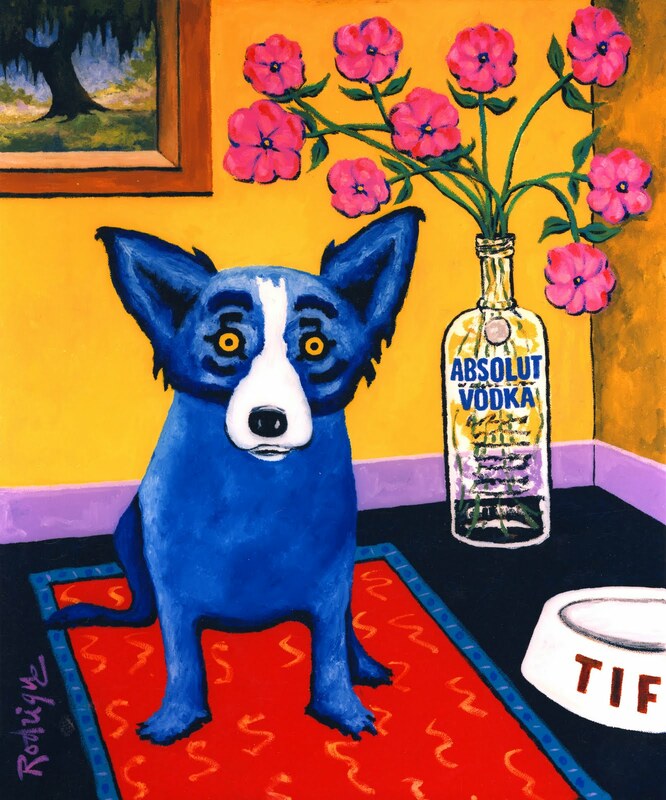 In addition to Absolut Vodka, the years between 1993 and 1995 saw the publication of the book Blue Dog, museum exhibitions in Bloomington, Illinois, Pensacola, Florida, and Frankfurt, Munich, Greven, and Landshut, Germany, a SOHO exhibition in New York City, a new Rodrigue Gallery in Munich, Germany, a poster for the New Orleans Jazz and Heritage Festival, and George himself as King of the Washington Mardi Gras (hosted in Washington D.C. each year by the Louisiana delegation). By the end of 1993, the galleries were hopping. I remember working seven days a week, opening the Carmel gallery some days at 7 AM just to catch up with the previous day’s paperwork, and because the gallery was exciting and full of people all of the time. It’s true; I even sold a painting early one morning to a jogger on his way down to the beach. In one month we sold twenty-six paintings in Carmel. 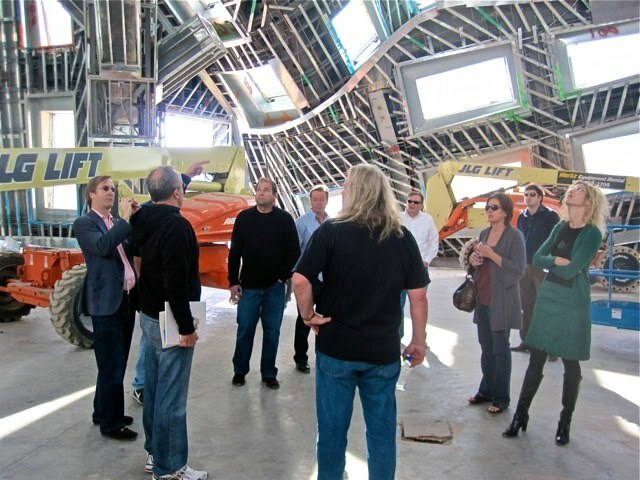 We looked like we’d gone out of business for several months after. Yet it was a fight to convince George’s agent to raise prices, and as a result every new piece sold within a day or two of arrival. For George the success was bittersweet. 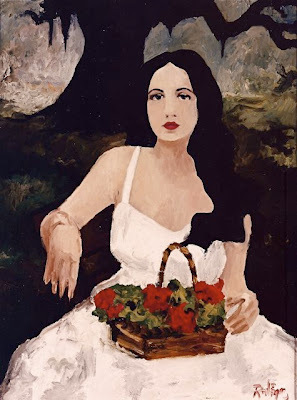 Yes, the money was great – the best he’d ever known – but he was painting twenty hours a day, and in two years, up until late 1995, he completed more than five hundred paintings. (Staggering when one considers the 35-40 paintings per year he completes now). 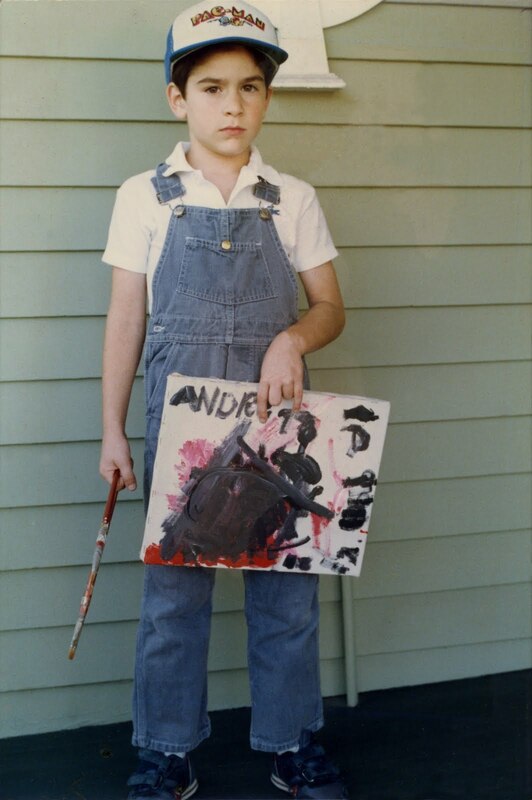 Also, as I’ve detailed before, he struggled during this period with the switch from oil to acrylic paint. He painted countless simple 9x12 and 11x14 canvases (sizes he abandoned permanently more than ten years ago) with single dogs and plain backgrounds. 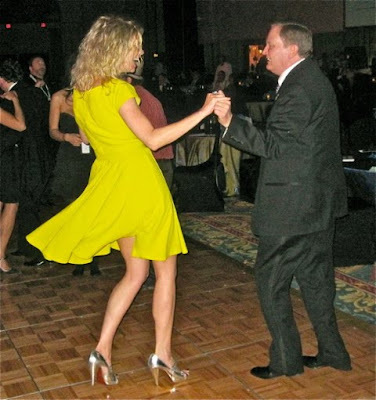 Bills mounted for complex personal legal issues, and relationships with his agent increasingly were strained. There was no time to think about meaning or direction, and it was seldom that George painted for himself. If ever the Blue Dog was a runaway train, this was the period. I don’t mean to describe an atmosphere of consistent artistic doom and gloom. There were some real highlights in this period too, especially the large-scale pieces for the SOHO exhibition in 1994, with canvases eight-foot square and larger (two are pictured below). I think George would agree, however, that his overall output between late 1993 and 1995 was pressured, forced – similar to those family portraits and festival posters of the mid-late 1980s. 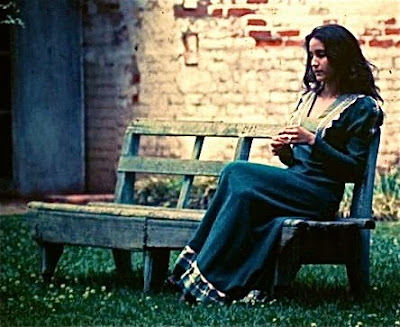 George and I had been dating for a while by this time, and I witnessed the ‘machine’ and worried. Despite his agent’s protests, I doubled the prices of every piece in the Carmel gallery overnight. We continued to sell, but fewer paintings, and yet we made more money. New Orleans was forced to follow. At last George slowed down, and by 1996 he created half as many paintings (still considerable), and by 1997 only a handful. 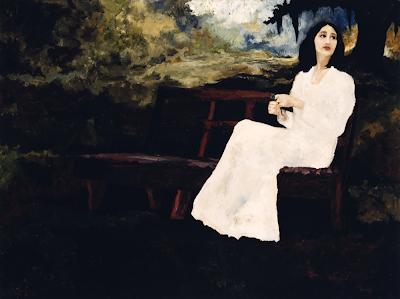 From that point on, he had control again and painted slowly and deliberately, what and when he wanted. But these creative, inspired years are the next phase, and so I’ve gotten ahead of myself. I’ve mentioned in previous blogs that the Blue Dog’s meaning continues to evolve. 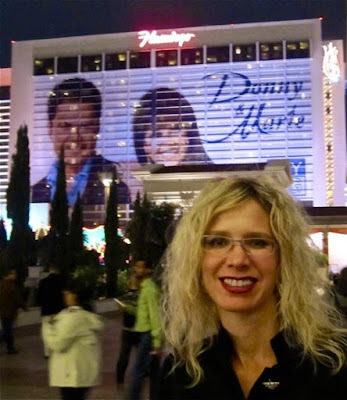 What began as the loup-garou and then the ghost of Tiffany melded into a signature of sorts during the mid-1990s. It lost any concrete definition in favor of pure phenomena, undefined, even though occasionally it referenced those early meanings and foreshadowed at least a few to come. In the galleries the sales staff talked about the loup-garou and Tiffany. We were all pretty adept by this time, and we each discussed the paintings in the ways that they appealed to us personally. 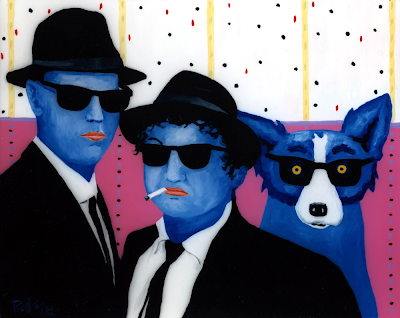 Not everyone knows the loup-garou, and not everyone has a dog that looks like the Blue Dog. More than anything we relied on the art itself, as opposed to some contrived ‘meaning’ to carry the weight. And it did, as has it always. 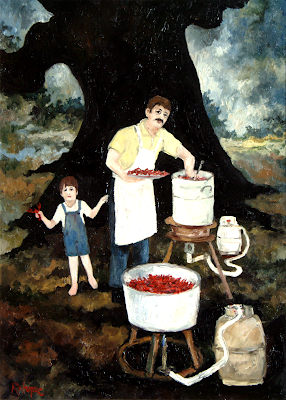 It’s just like George used to say about his paintings of Cajun folk life. They rarely sold in Louisiana as one would expect; rather, they sold to people in other states around the country, states without Cajuns, because in the end it’s the art itself, how it’s painted, the style, the context, and the man behind it (I can say that as the wife) that makes it different than…well…some other dog painting. George Rodrigue has epiphanies at the strangest times. He’s written movie scripts on airplane sick bags, designed cars in the middle of the night, and composed country western songs while changing light bulbs. He went on to explain that the mediums themselves are the biggest problem. In contemporary literature the thing itself is still a book, with pages and words, a beginning and an end, and a narrative of some sort. But in art, the medium is felt and fat (Beuys), bugs and cigarettes (Hirst), vacuum cleaners and sharks (Koons), or any number of installations from recent art fairs (my apologies for not recalling the artists), such as an empty white room, or a repeated “boom” in a tent, or a copy machine suspended from the ceiling, spitting out blank paper so that it falls on the visitor’s head one slow piece at a time. Paint on canvas is passé, and in the world of contemporary art, George Rodrigue is a dinosaur. 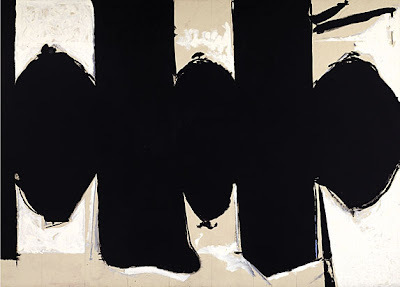 He goes further, commenting on borderline contemporary/modern artists: he gets Motherwell and his Elegies (pictured below), Indiana and his words and numbers, and Oldenburg and his giant safety pin. He appreciates the tension between positive and negative spaces, the idea of a word changing a meaning or the other way around (we have an entire set of Indiana’s Numbers circling the walls of our living room), and the process of taking something completely ordinary and increasing its size to an absurd scale, turning it into something utterly unordinary (and pretty cool, I might add). He gets these artists, but he doesn’t get others: Ruscha, Holzer, and Kruger with their single words and electronic or stenciled messages, or Kiki Smith with her animals and aborted babies and glass stars in a corner. 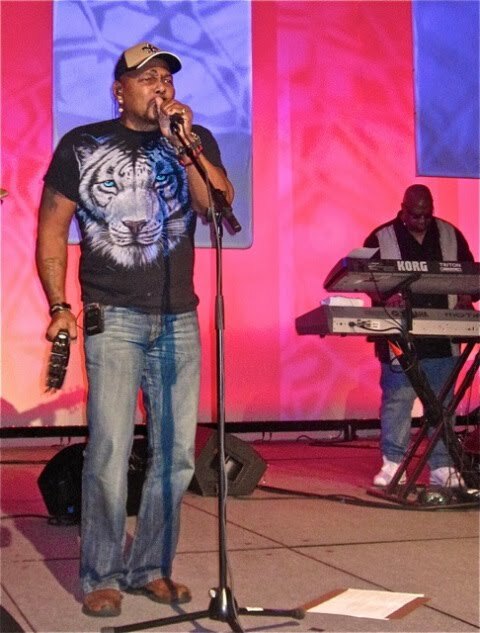 … All of whom I rather like, which makes for great discussions. And although he won’t admit it, the feminism probably irks him; remember, in many ways, but not all ways, George is old school…. 1950s New Iberia, Hank Williams, paint on canvas and all. Also, I think a lot of his artist-hierarchy has to do with which artist he discovered first, regardless of their true timing, after which he sees any others as mere copycats. Along these same lines, I find it ironic that George’s 40-foot installation on the New Orleans Sheraton includes the words, “Art is a timeless expression of a moment,” a statement with resonance if one considers Bruce Nauman’s neon sign from 1967: “The true artist helps the world by revealing mystic truths.” However, I don’t dare point that out. He gets Rothko (my favorite) and his floating planes of color; he absolutely gets and seems most drawn to Pollock and the drip paintings; and he even gets Newman, although he finds the art simplistic and rather boring, since (to him) the reduction of shapes to one straight line is so obvious as to hardly be worthy of contemplation. 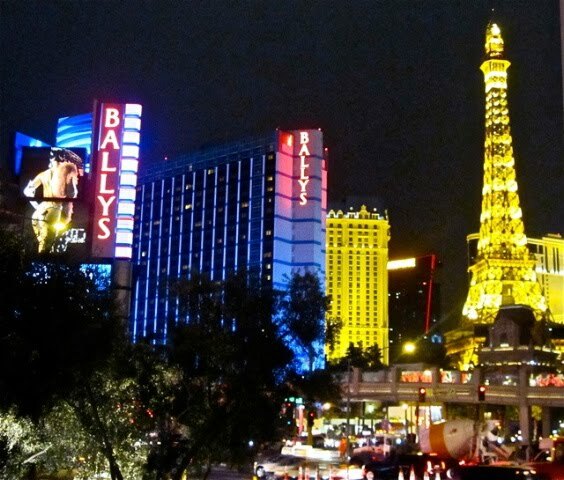 We’re in Las Vegas this weekend, a place devoid of contemporary art as far as I can tell, unless one contemplates the entire strip as one big contrived installation, as though it’s some cosmic diorama, a snippet of the surreal. Everything is exaggerated here. When poised between the Eiffel Tower, the Statue of Liberty, and an erupting volcano, even the full moon seems like a stage set. It’s a place where a cocktail purist like me replaces the olives in my occasional martini with even more indulgent blue cheese stuffed olives, because the plain ones seem too boring for this setting, too dull beneath the original Botero or Picasso or Renoir hanging above the bar in the artist-inspired restaurants. (It’s a place where we all become snobs in one form or another). 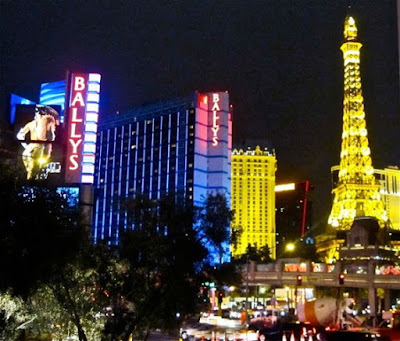 It’s a place to see Tom Jones or Cher, to remember when… and not feel guilty about it, and to wear an evening gown (or a sequined bikini – yes, we saw it with our own eyes) to dinner, because nostalgia, exaggeration, and bad taste are the norms here. 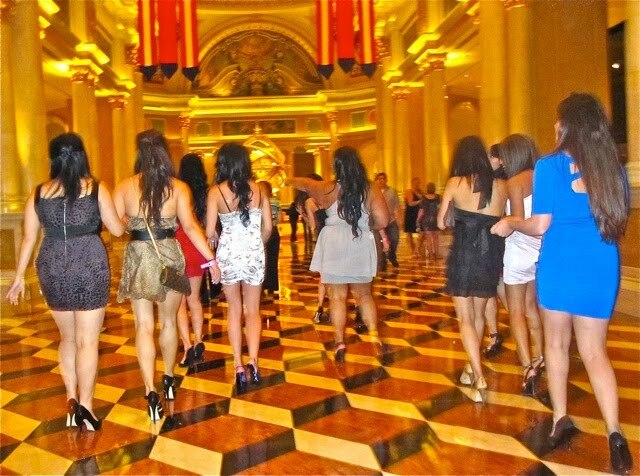 I’m going to have a party in Las Vegas one day and require all of the female guests to wear wedding gowns. How appropriate that yesterday afternoon we stumbled on a contemporary architectural wonder currently under construction and housing a hospital specializing in Alzheimer’s and Parkinson’s treatments. 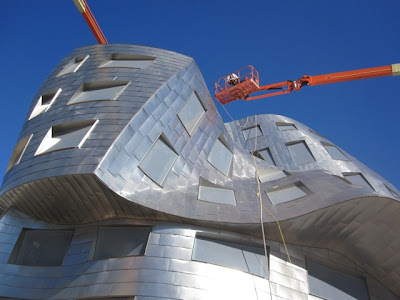 The Cleveland Clinic Lou Ruvo Center for Brain Health was founded in Las Vegas by Larry Ruvo in memory of his father. Never one to think small, Ruvo hired architect Frank Gehry, most famous for the Guggenheim Museum in Bilbao, Spain, to design the building. 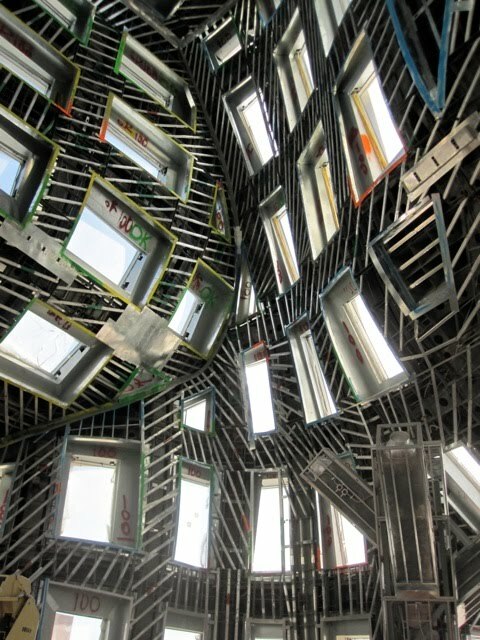 It’s halfway through construction, and we lucked out with a tour that my college art history professors would have fainted over. George is the official artist this year, the event’s fifth anniversary, meaning the room was filled with Blue Dog images alongside star chefs like Mario Batali and Charlie Trotter, musicians like the Neville Brothers and Sammy Hagar, and top winemakers and sports figures and business people, all here to support these worthwhile programs with contributions of their time, talents, and money. 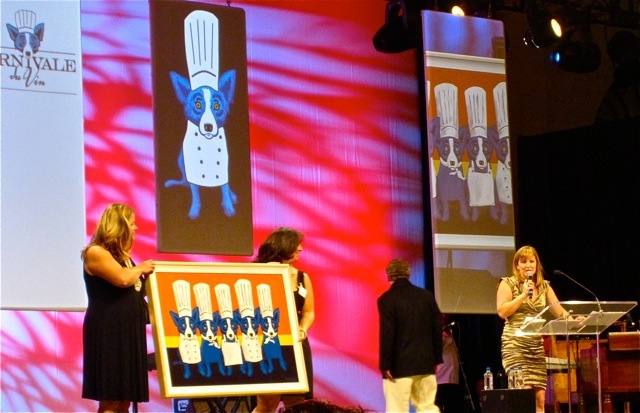 For George’s part, in addition to the Blue Dog image use, he donated the original painting Heat in the Kitchen, which brought $105,000 during the live auction for the Emeril Lagasse Foundation. For some reason, in addition to contemporary art, outrageous fashion, and creative cuisine, this weekend in Sin City also lead George on a lengthy walk down memory lane (must have been the Donny and Marie sign). He talked about his years at Philmont Scout Ranch along with a poignant moment involving a broom at Camp Thistlethwaite, where he worked in the supply store. But now I’ve really digressed, so more on this in some Eagle Scout post down the road. 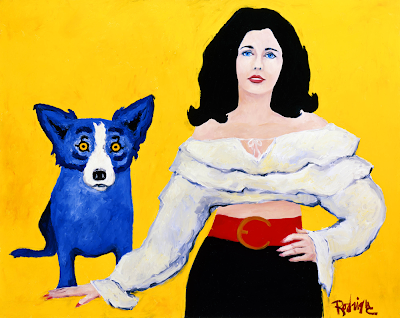 There are enough Rodrigue Evangelines to fill an entire museum exhibition. 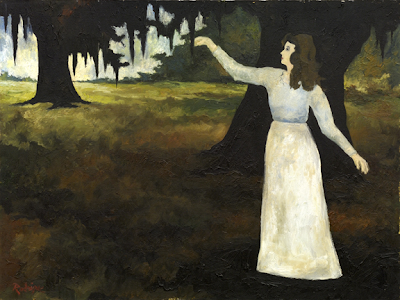 He’s painted the Acadian heroine one hundred or more times over nearly forty years. 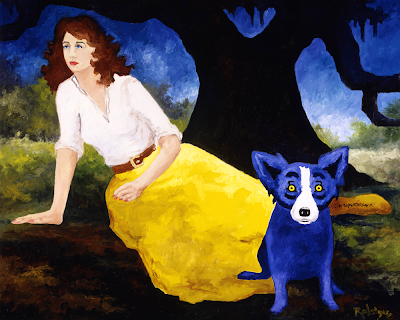 Like Jolie Blonde, the Oak Tree, and the Blue Dog, she is a staple in his work, a protagonist as much for him as she is in the story of Acadiana. “Fair was she to behold, that maiden of seventeen summers. Black were her eyes as the berry that grows on the thorn by the way-side. Her lover, her fiancée Gabriel, “a mighty man in the village and honored by all men,” was the son of Basil the blacksmith. 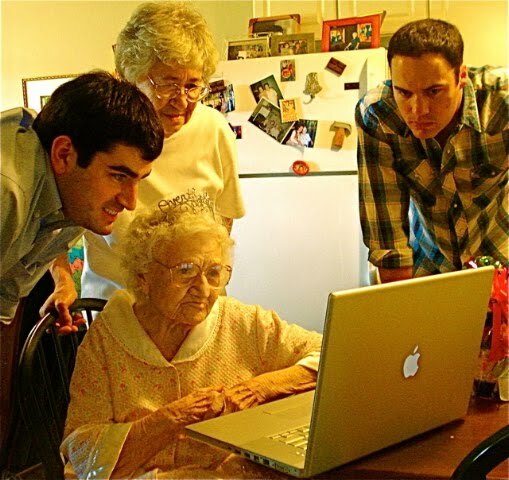 Among her many suitors, it was only Gabriel who won her heart. 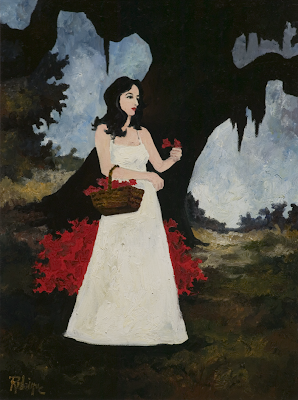 It’s a heartbreaking, romantic story --- the vision of Evangeline wandering for years along the banks of the Bayou Teche and beneath the splendid Louisiana oaks. 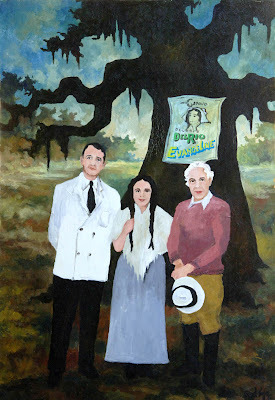 The legend inspires many artists, and its mystique is so great that the towns of New Iberia and St. Martinville disputed the location of the 'Evangeline Oak,' purportedly the place she wept and “stood like one entranced.” George’s mother remembers the public controversy in the 1920s when both cities claimed this landmark tree. Although St. Martinville eventually won out, for many residents any grand and ancient oak in southwest Louisiana deserves the title. From the beginning Evangeline was a natural painting subject for George. 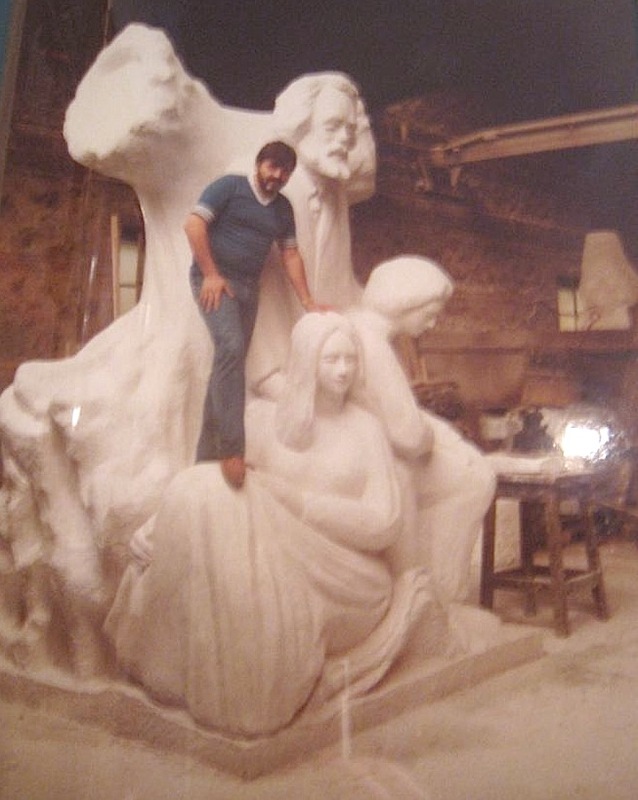 He also incorporated her into his first major public sculpture. 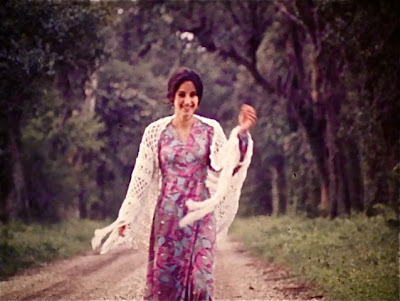 He photographed Diane Bernard Keogh hundreds of times during several sessions in the 1970s and used these same photographs for Evangeline paintings over the next twenty years. 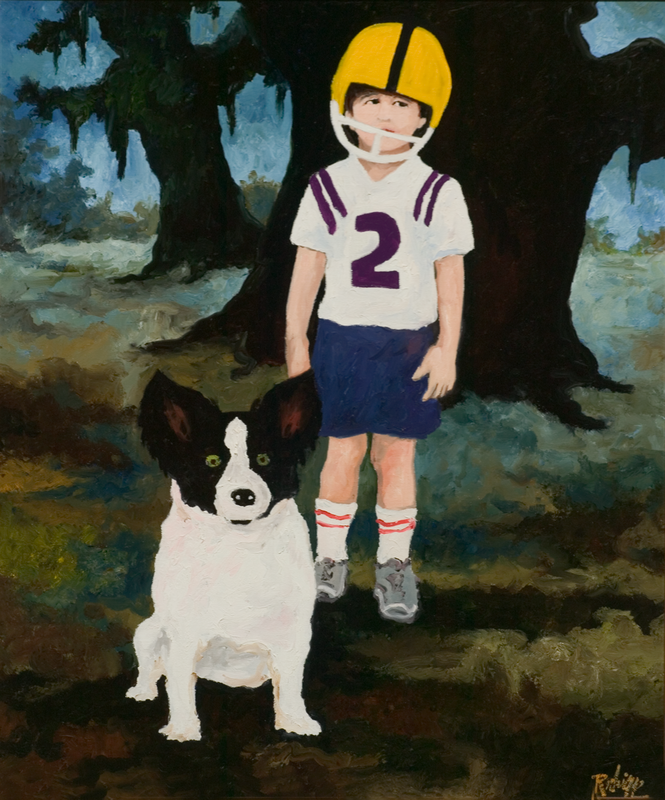 In an ironic twist that Evangeline herself would appreciate, Diane came to work for George in 1996 and remains an important part of Rodrigue Studio today. “O Gabriel! O my beloved!”Art thou so near unto me, and yet I cannot behold thee? 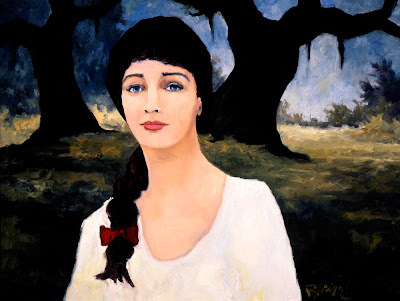 … perhaps a heroine not just for Louisiana, but for all who search for love. 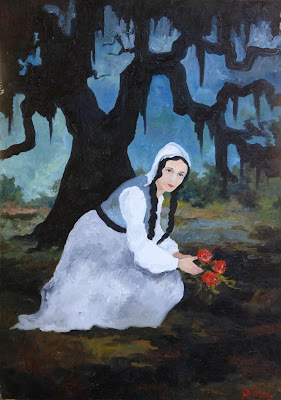 For more on Rodrigue's sculptures of Evangeline see the post "The Bronzes"
For a related post discussing Rodrigue's use of photographs and models see "Nature Girl (The Art of Modeling)"